Resistograph on sale now at IML!!! If you've ever considered purchasing one of these units, now is the time. IML USA is offering a $500 discount with free shipping on all models. They also have a pre-order special on refurbished F300S units. This is the entry level resistograph and its only $1,500. I just ordered mine today. You can e-mail James at james.baribeau@imlusa.com for more info or to pre-order. Tell him Brett sent you! That's the price point I've been waiting to see. Could never see spending $2,500-$5,000 on one of those things. I've been thinking about getting one...but then I called and they wanted like $5000. $1,500 is reasonable. I think I'll do that. The less expensive one doesn't have a paper readout. Personally, if I was going to step up from using a cordless drill for resistance drilling, I'd probably save my bucks and look at tomography equipment. It's completely non invasive, and maps the entire stem, rather than just the area you're drilling. I think I heard that sonic tomography equipment is reaching the 10K price point. Guy may have a perspective to share on this. I think he recently pulled the trigger on an S.T. setup. The less expensive one doesn't have a paper readout. That is incorrect. 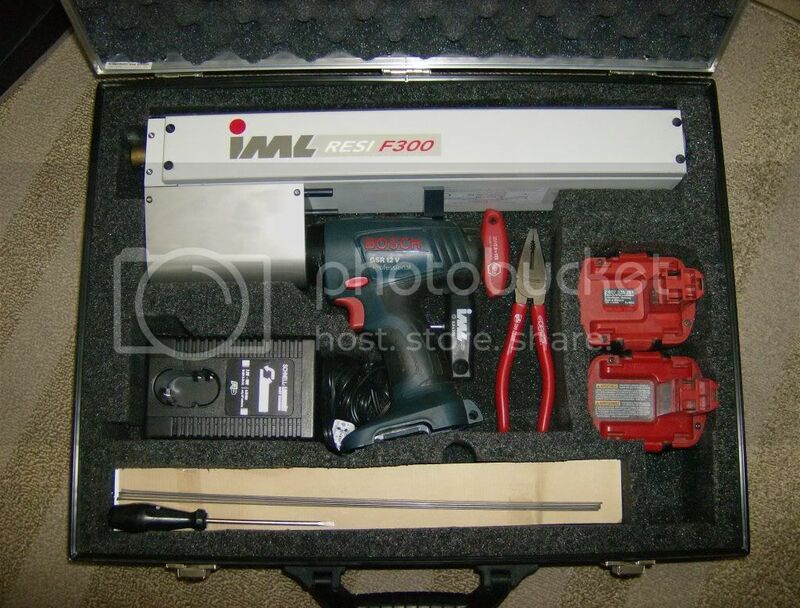 "The IML Resistograph F-series is driven by a cordless drill and is very easy to handle. The instrument is cordless and therefore ideal for difficult operating conditions. The measurement profile is recorded simultaneously to the drilling depth on a wax paper strip. From $1500 to $10,000 is a bit more than a "step up", doncha think? I'm saving my beans for a Rinntech resistograph and a Rinntech Arbortom. I stand corrected. I was thinking of the md300 as their entry item, which doesn't paper record. If I was going to step up from my current cordless drill for resistance drilling though, I'd still go tomo. This is definitely a special offer, and a great value. Its perfect for the arborist who has wanted to get their hands on one, but never was able to make that capital investment! cerviarborist: The F300S DOES capture the measurements on paper. The MD300 is the one that performs by "feel". I would be happy to discuss the differences and benefits of the resistograph over the various tomographs on the market, but I would like to do that via email, or in a separate thread. treegazer: I would love to chat with you about the differences between Rinntech's products and IML's. I think you will find the information that I have very compelling. My "new" Resistograph has arrived! Are those batteries Nicad or Lithium? All of the units have arrived, and we are just waiting on the hard sided cases before we start to ship! I still have a good number of them available, and would love to put them in your hands. Please contact me @ james.baribeau@imlusa.com and we can discuss the order process. These things will prove invaluable to you once you get your hands on it and put it to use! Please do not hesitate if you have ever thought of acquiring one, now is the time! Does this unit drill through the tree? James, you should go ahead and answer questions here, so you don't have to repeat the same thing over and over again. What is the length of the drilling distance? I'm in the boat of always wanting one, but they were too expensive before. drill bit size? Easy to replace the bit if we break it? oh, i just realized the other posts except the last 3 were months old. I guess you are done taking orders? Does this unit drill through the tree? Yes. It makes a 3.0mm hole, but does not remove any of the filings. The tree is capable of closing the wound within two weeks, if not in just a couple days. What is the length of the drilling distance? The Drilling length is effectively 11.5" inches. I'm in the boat of always wanting one, but they were too expensive before. This unit, sells new for over $4000, is available now for only $1500, and I will personally be available to fully support you on its use. drill bit size? Easy to replace the bit if we break it? The bit sise is 3.0mm at the tip, 1.5mm on the shaft, overall length is 372mm. The bit is held inside the unit with a set screw on the resi chuck, and changing the bit is simple. IML Resistograph F-Series Manual You can see the Manual at this link in PDF format. It explains the full operation of the F Series Resi, including the needle change. Data Interpretation Manual The Data Interpretation Manual written by Dr. Julian Dunster. READ THIS and you should understand what you can learn from the Resi. I AM AVAILABLE DIRECTLY - 978-335-3905 is my cell phone. When you call just tell me your from tree buzz! Ill answer almost always, and call you right back if I dont. You should also read about SIA and SIM and try to understand what the limits of a resistograph is. Brudi, amongst others, tells us how one drill hole realtes to tree breakage resistance. I also wonder about the usefulness of a paper copy vs. Rinntech' Decom program. Additionally there is the issue of compromising CODIT Wall 3 and thereafter intorducing decay into the sound wood that wall 3 was trying to protect. Sonic tomography is a better approach. All of these techniques are highly advanced and relatively new tree evaluation techniques. I personally would not acquire any of them and prepare formal assessment reports unless i were heavily mentored by someone very intimate with these (picus, tomography, sia, resistograph etc). With minimal mentorship as to how to evaluate the findings these systems produce would leave one vulnerable to heavy litigation. Decay is a serious issue to consider but it is not limited to resistographs, any instrument that breaches the cambium layer risks spreading disease. Aggresive diseases such as Ustulina will likely be spread with the nails used in tomography. "With minimal mentorship as to how to evaluate the findings these systems produce would leave one vulnerable to heavy litigation." While you may be vulnerable is this a serious issue? I wonder how many arborists have been sued over the quality of a tree risk assessment (and thus their knowledge)? Does the use of a ressitograph require any more mentoring than VTA does? With minimal mentorship as to how to evaluate the findings these systems produce would leave one vulnerable to heavy litigation. I would refer you to a couple of studies relating to violation of the CODIT walls and introduction of decay / cross contamination. In addition: Using the Resistograph requires no real mentor aside from self mentoring and self education, but it is CERTAINLY available. I am personally happy to work with you in person, or setting you up with someone in your area who does work with the Resi. I travel the country attending different shows and conferences, and would be happy to extend any trip by a day to work with anyone who needs the collaboration. I will also travel especially for your company should you require it, but you would incur travel expenses. You could also always plan a trip to sunny Florida, and ill give you my time for FREE! then take the next two days and see Disney! As far as facing potential litigation, I would argue that thru use of the resistograph data you would be subjected to LESS litigation. Resistograph data is used in courtrooms across the US and Canada. The data is legally accepted, and it takes a glance from a 5th grade student to effectively identify dangerous levels of decay/cavity in the measurements.